This book is a delightful and absorbing biography written from the author’s unique perspective as a younger brother of Paramahansa Yogananda, whom he affectionately called “Mejda”—the Bengali term for one’s second eldest brother. It provides an intimate account of the early years of one of the great spiritual leaders of our time. Relating many previously unpublished stories, this fascinating biography presents a fresh view of numerous incidents recounted by Sri Sri Paramahansa Yogananda in Autobiography of a Yogi. As Sananda Lal Ghosh explains, Paramahansaji was naturally reticent about referring to his own spiritual attainments when writing his autobiography. “Mejda” offers readers a vivid, firsthand chronicle of his remarkable years in India. From the book’s engrossing narrative emerges a new portrait of this beloved world teacher—a radiant spiritual personality whose life was an inspiring testament to the ageless truth and vitality of India’s universal science of God-realization. Sananda Lal Ghosh (1898—1979) was the brother and childhood companion of Paramahansa Yogananda. His deep religious interests and creative spirit found many-sided expression as artist, photographer, mechanic, architect, musician, and finally as author. In the late 1950s he painted a portrait of the famous Nobel-prizewinning poet, Rabindranath Tagore, which received worldwide acclaim. Over the years he produced hundreds —perhaps thousands— of photo portraits of his respected brother for disciples throughout the world. In the same tireless spirit of dedication he worked on the manuscript of this book, which was completed shortly before his passing in 1979. Mejda”: The Family and Early Life of paramahansa Yogananda, written by Paramahansaji’s younger brother, Sri Sananda Lal Ghosh, is a valuable biography of the great Guru. An excellent supplement to Paramahansaji’s Autobiography of a Yogi, it presents many incidents about Paramahansa Yogananda’s family and early life in India not included in his autobiography. Autobiography of a Yogi is regarded as an Upanishadt of the new age. Published in twenty one languages, it has satisfied the spiritual thirst of hundreds of thousands of truth-seekers throughout the world. We in India have watched with wonder and fascination the phenomenal spread of the popularity of this book about India’s saints and philosophy. We have felt great satisfaction and pride that the immortal nectar of India’s Sanatana Dharma, the eternal laws of truth, has been stored in the golden chalice of Autobiography of a Yogi. Paramshansa Yogananda’s life and work are captivating. As a true propagator of the Hindu religion, and as the spiritual pioneer who was divinely chosen to disseminate Kriya Yoga worldwide, Paramahansaji’s fame has spread like a fragrance from the Kolkata home at 4Garpar Road, from the Serampore hermitage of his preceptor, Swami Sri Yukteswar Giri, and from the Brahmacharya Vidyalaya in Ranchi to America and the farthermost horizons of the globe. Under the banner of Yogoda Satsanga Society of India/Self- Realization Fellowship, he established numerous meditation centres in many lands. The ashrams, temples, and centres of his work are holy places for the practice of India’s great science of Yoga. Devotees of Paramahansaji from many countries have visited their gurudeva’s home in Kolkata, and have thrilled to hear from his brother stories of Paramahansaji’s childhood and early life in India. “Mejda” is a grand accomplishment that will share with a wider audience these stories of an uncommonly spiritually powerful ascetic. Many of these were not included by Paramahansa Yogananda in his autobiography because of his natural reticence about calling attention to himself. It was quite unexpected that I should be asked by the author to write the foreword to this book. Though the question of my competency arises in my mind, I have acceded to the request because I feel it a great privilege. While on summer vacation in 1938, in the hermitage of an ascetic on a hill in Chotanagpore, I heard about the glorious life of Paramahansa Yogananda. I was overwhelmed. Later, when I was in the Chakrebaria area of Bhawanipore seeking out a manuscript of “Padma Puran,” by Jiwan Moitra, in the course of my work I went to the house of a devout person to see a highly regarded white statue of Lord Krishna. I was surprised to meet there two American disciples of Paramahansa Yogananda who had come from his ashram in Ranchi to view the beautiful image. Then one day, Sri Sananda Lal Ghosh invited me to visit him. I learned during our conversation that Paramahansaji had found God in this house at 4 Garpar road. I went to the attic room, made sacred by the great yogi’s sadhana, bowed down and sat for some time in meditation. In one of Paramahansajis letters to his brother he had said, “This is my holy pith [seat, place] where I found God.” It was my good fortune to have the opportunity to pay my respects at this sacred shrine — a precious moment in my ordinary life. I cant but wonder if through his divine power Paramahansaji had accepted my humble obeisance in the hermitage of the ascetic on the hill of Chotanagpore, and blessed me with his grace that I could visit his attic room where he pursued his sadhana and that, as a result of that visit, I was given the opportunity to write the foreword to this book. In this modern age, it is wonderful that in spite of the materialism of the West, innumerable persons there have shown such interest in the spiritual accomplishments of Paramahansa Yogananda, a yogi from the East. The divine power of Sri Ramakrishna Paramahansa is widely known; he is worshipfully venerated by all spiritually minded people throughout India, and by many abroad. The mysticism of great saints has a deep appeal and promise of hope for the troubled human mind.Thus, many have been similarly inspired by the life of Paramahansa Yogananda, and Yogoda/Self- Realization members from all over the world have come to his childhood home to hear firsthand accounts of his early life from his brother, Sananda Lal Ghosh. He was Paramahansaji’s follower, devotee, and companion during the great yogi’s childhood. And now, in the closing years of his life, Sananda Lal Ghosh has undertaken the task of writing this book to share with all seekers these spiritually rich incidents in the life of Paramahansa Deva. The effort crowns the author with glory. His work has significant historic value, since many of the incidents he has recorded took place in his presence. Paramahansa Yogananda was born in a family of virtuous yogis. His father was a true ascetic, while at the same time he fulfilled admirably his family responsibilities. His mother was like a goddess. Paramahansaji’s parents were initiated by Yogiraj* Lahiri Mahasaya. Born Mukunda Lal Ghosh, Paramahansa Yogananda had three brothers and four sisters, all of whom were reared in a spiritual environment. Each brother achieved a high degree of success in his own field. The eldest, Ananta Lal, was well established in his work in accountancy, and greatly respected. He achieved the position of a high-ranking officer, earning a large salary while still a young man. His affectionate concern for his brothers and sisters was exemplary. He was frugal, moderate in his habits, kind and benevolent. Initially, he had not much faith in religion. Through the spiritual influence of his younger brother Mukunda, Anantas whole outlook changed, and he received initiation from Mukunda. Ananta Lal died at the age of thirty-one. Paramahansaji has lovingly described his life in Autobiography of a Yogi. Sri Sananda Lal Ghosh is himself an accomplished yogi. In his full life he has combined the qualities of artist, musician, architect, mechanic, and devotee of God. The paintings of Paramahansa Yogananda by Sananda Lal Ghosh have been widely acclaimed. His painting of Rabindranath Tagore, chief among India’s Poets, has received worldwide recognition. This picture hangs in many of the schools and colleges of India. R.abindranath himself felt it was the best standing-pose of him ever painted. He personally complimented Sananda by sending him a certificate to this effect. A marble statue of Tagore installed in the Assembly Hall m New Delhi is patterned after Sananda’s painting. The late Bishnu Ghosh, youngest child of the family, gained national and international fame as a physical culturist. He was the first and only Indian judge in Mr. Universe contest held in London. He was the first Indian of contemporary times to introduce and make popular a system of Hatha Yoga that appealed greatly to the general public. He brought the ancient science of Hatha Yoga out of the hermitages and into the court-yards of homes and the fields of villages. I was charmed to meet Bishnu. He exuded a warm personality, strength, courage, sincerity, and highmindedness. He was a devotee of God, as well as a genius in the field of Hatha Yoga and physical culture. He was a pride of India, and will ever be remembered for introducing yoga exercises to the masses. Paramahansa Yogananda was a Yogeshwar (Lord of Yogis). His mastery of yoga came to him as a natural inheritance. The renowned Lahiri Mahasaya was the guru of Paramahansaji’s parents, and of his guru, Swami Sri Yukteswar Giri. In the historic and traditional lines of illumined masters who bring truth to the world, Paramahansaji was the fourth of the Yogoda/Self Realization line of great Gurus. * Paramahansaji’s mission led him to preach the art and science of yoga-living in America, Europe, and throughout the world. 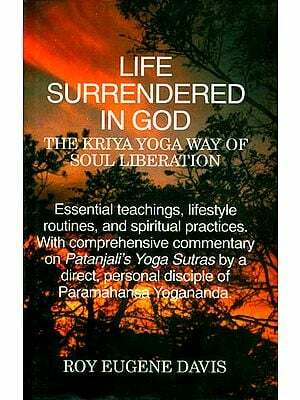 It was commonly thought that the practice of a soul science like Kriya Yoga was restricted to secluded ascetics in forests and mountain caves. Paramahansa Yogananda’s mission was to show that a person in ordinary family life anywhere in the world could receive and practise Kriya Yoga with highest spiritual benefit. He has rendered a supreme service to mankind by bringing the science of Yoga, and the technique of Kriya Yoga, into practical everyday application in life. Persons in India and worldwide will receive beneficent effects by learning the Kriya Yoga as taught by Paramahansa Yogananda. “Mejda” is a great light of oblation to the worldwide spread of Kriya Yoga. In writing Autobiography of a Yogi, Paramahansa Yogananda — whom I respectfully call “Mejda,” second elder brother — omitted several revealing incidents of his early life. I believe he did so purposely. Had he fully disclosed himself, he would have surpassed many of the contemporaries he extolled. Some might have thought the Yogi Maharaj * was given to praising himself. On the contrary, it was always his way to place himself in the background and push others to the fore. 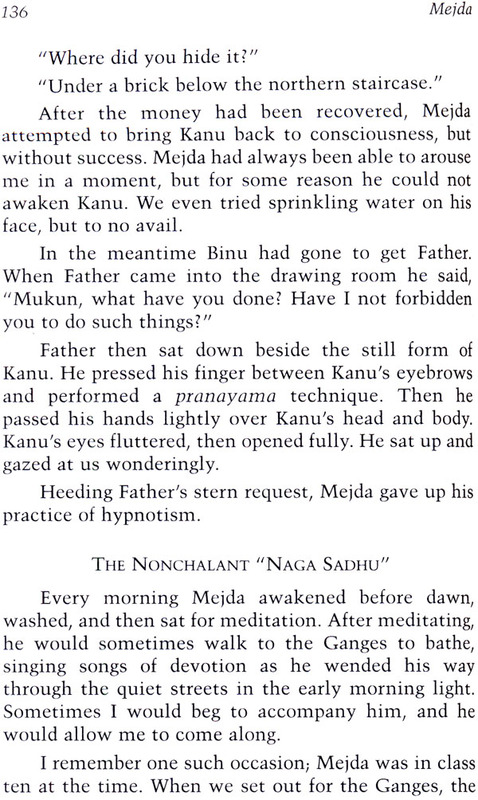 So I have long felt that Autobiography of a Yogi, to be complete insofar as Mejda’s life story is concerned, needed a sequel to make public many of the incidents of his early life. For several years I have labored to this end. The plant of my desire has now matured. Had I not received timely inspiration and help, the seedling of my wish would have been destroyed by circumstances; I would have exited this world with a heavy debt unpaid. Mejda was my childhood companion and friend, and the guiding light of my youth. The most prized treasures among my memories are of those incidents that were a part of the early years spent with my wise preceptor, Yogeshwart Yogananda. Inspired by Autobiography of a Yogi, many Yogoda Satsanga/Self -Realization Fellowship devotees from all parts of the world have come on pilgrimage to their Guru’s beloved India. Many were persons of ordinary means who had to save for years in order to make the journey. During every season of the year, they have visited Mejda’s childhood home, the holy place of his early sadhana, 4 Garpar Road, Kolkata. Out of reverence for the Yogeshwar, they have regarded his home as a special place of pilgrimage, and have bowed their heads in devotion as they entered. Ofttimes, when ascending the staircase to the upper floors, they have reverently placed the dust of the steps on their heads, recalling that Paramahansaji climbed these stairs many times. The pilgrims visit the room where he slept and the front room where he conversed with Mahavatar Babaji. They especially request permission to meditate in the small attic room where their guru meditated daily and which was witness to the early dawn of his spiritual awakening. They have been deeply gratified to meet members Mejda’s immediate family, and to hear stories of his ‘boyhood. All have earnestly requested that 1 publish these stories, since I was a companion to him, being only five years younger than he, and an eyewitness to many of his early-life experiences. In narrating these stories, some references to myself have been unavoidable. It is not my desire to give myself any prominence. I have made mention of myself only to give testimony to the verity of these unusual incidents in the life of Mejda. Dr. Ashutosh Das, M.A. (Double), Ph.D., D.Litt. (Kolkata), F.R.A.S. (London), Professor of Philosophy and Literature at Kolkata University, particularly encouraged and supported the publication of this book. His two sons, Sri Prem Sundar Das, M.A. (Double), B.S., L.L.B., and Sri Dibya Sundar Das, M.Comm., L.L.B., assisted valuably with the writing of this book. It would not have been possible to complete my work without their help. My neighbour, Sri Binay Das, assisted me gratuitously. My grandson, Somnath Ghosh, was an able, enthusiastic helper. My wife, Parul, contributed greatly; it was one of her last offerings in this mortal world. I was bereft of her faithful companionship of many years when she died on September 3, 1978. I here express my heartfelt appreciation to each of them.